All of us know that the typical food of Russia is not as popular as other countries foods in Europe (such as Italy, France or Spain). Reading this article you will notice that they have a wide range of principal dishes and desserts that must have a greater diffusion due to its exquisites. The Russian cuisine derives from several rich dishes, due to the multicultural and diverse of the country, as well as its size and geographical possibilities. Russian cuisine culinary fundamentals in the food of rural populations of Russia located in places with very different characteristics, and with extremely cold weather. The gastronomy of Russia is varied, tasty and flavored, its cuisine blends the best cuisines Eastern and Western, offering sweet and sour flavors. 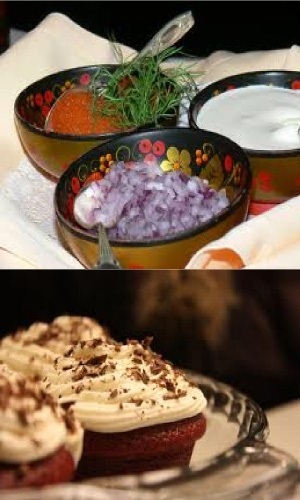 Section One: Russian food with the description of the typical food Russian with examples of most popular dishes. Section Two: Guide to local fast food, based on the traditional Russian cuisine. Section Three: Dictionary for eat in Russia with the words and expressions more ideal to understand the Charter, to request food in a restaurant or bistro. Good thing that you must know, is that the restaurants, bistros and pubs are open all day, not only for lunch and dinner hours, so you can eat at any time.